We went to a friend’s house for dinner tonight. It was a good time, some mellow hanging out and a meal together. Then we headed out for some trick or treating, one stop at a house along the way and then to the neighborhood in town. The town threw a party and half of us went to that. The kids hauled in some good loot. I took my son to the video store. It is going out of business, so all the films are for sale. We picked up a few. He got to show off his tractor costume which was, as at every stop, a hit. He picked out a few Thomas the Tank Engine videos and that made him happy as a kid on Halloween. We have a pile of candy now, right on the floor with the children sorting through it. I just polished off a peanut butter cup. Tasty. We tossed a couple of random gelatin type jobbers. They look fun but were probably made in China and who needs more lead? We will still have plenty for many days. Happy Halloween. No costumed children visiting this house with its long long driveway, even if we do leave the light on. In fact, we left a bowl of the sweet stuff on the deck with the porch light on while we were out. No takers. All the more for us, right? It’s just what we need. 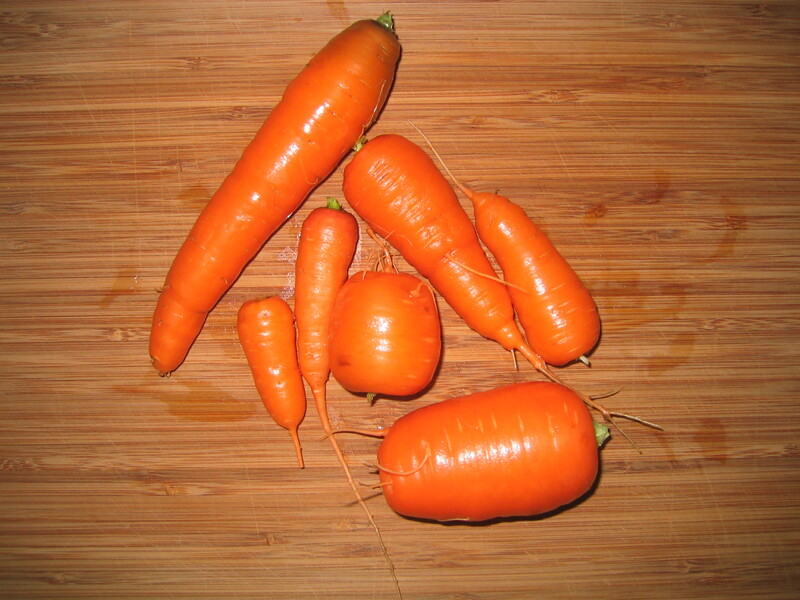 Here they are, the final carrots from the garden. Nothing but dirt out there now. The parade was a grand affair for the children, with floats and firetrucks and costumes and, of course, candy. Parades have become a forum for tossing candy to children so that they can learn how to run out into the street, but this parade tops them all. Halloween is all about candy, so every person on every float tosses candy, and they they have someone walking the curb to hand it out as well. We walked away from the parade with two pretty good sized bags full of dented chocolate bars and shattered lollipops (all that tossing takes its toll). Right now we have three bowls with candy in them, as well as a large Tupperware bin of stuff we weeded out to give away. It is a good thing that last one has a cover or we would be digging into it as well. The rain stopped some time in the night but we ended up getting a lot of it, 3/4 of an inch to an inch. Things were wet this morning. But the sky was clear and the wind blew. It was a perfect day for the clothesline. I got the first load of laundry in early and I was out by 10:00 AM. OK, this may not sound early, but the sun doesn’t swing around to hit the clothesline until after 9:30, so it was just about right. I ended up getting in three loads of laundry and hanging it all on the clothesline today. The first and second loads were not a problem but by the third load I was running out of space. We have one of those spider web type clotheslines, what they call an umbrella dryer. I had to pull down some of the lightweight items that were dry from the first load both to create enough space and to provide the clothespins to hang everything. We had waited all week–longer actually–to do laundry and we lucked out with the weather. I just needed to puzzle out how to make room for everything for our family of four, including children who love mud. The thing is, I love to use the clothesline. It is meditative, I suppose, whatever one may think of that term. I love the smell of wet clean clothes and the feel of sun and wind as I hang them. I like to take the time outside to avoid using the dryer. We have a dryer and we use it, but I am not a huge fan. I like the clothesline because our clothes feel better when they have dried in the air. I like it because our clothes last longer. I don’t need to iron my shirts if I hang them out. And best of all, we save energy. Whenever I use the dryer (think January, cloudy, light snow, ten degrees) I have pangs at the electricity we use. 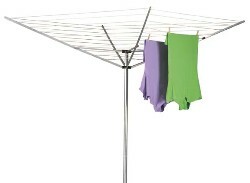 The clothesline gets the job done for free, with no air pollution and no wasted energy. Is that a bargain or what? My breakfast fuels the job, rather than Hydro Quebec’s dams or Vermont Yankee’s nuclear plant. Seems smart to me. I did spend some time today strategizing how to get it all done. If the laundry stays out too late, the dew sets in and the drying gets negated. I zipped out ten minutes before we planned to leave today (for a Halloween parade no less) to make sure I took down everything I could. But in the end it all got dried, folded and put away for the next wearing. I took the last pair of jeans down just before the sun ducked behind the trees. I did wear mud boots to hang the shirts and towels and sheets. The rain may have ended, but it left behind some saturated ground. At one point I dropped a dish towel. It was instantly muddy. Now that’s a functional towel, I thought, if it can soak up moisture that quickly. I held off on hanging that one. It made its way back to the laundry bin. It will have its day in the sun the next time. So we had this fall/harvest/Halloween shindig this afternoon and it was a blast. I spent about four hours in the kitchen making soup and pie. The soup was pretty easy and relatively quick. The pie took a while but I managed to make two of them, apple of course. The first pie was a recipe from a cookbook (or most of a recipe). It has cheddar cheese right in the crust and the usual truckload of butter, a dash of cinnamon, vanilla, sugar. I used mostly Macintosh apples but I also added a bit of Honey Crisp, since we had a few of those hanging around the house. It turned out well, as it has for me in the past. I made the second apple pie with a crust recipe my mother gave me years ago. That crust contains vinegar. The pie was all Macs this time but I spiced it differently, with a little cinnamon but also with cardamom. It, as well, turned out to be a winner. I made both crusts by hand, literally. Instead of using the food processor shortcut, as I often do, I worked the dough with my fingers. This makes a far better crust, even better than using one of those pastry cutter jobbers. These crusts, while different, were flaky and tasty. They held up but could be peeled apart. They were crispy and sweet. That worked for me. Once the soup and pies were consumed and the children were rounded up and the conversations ended and the gang took off, I did what any party host does. I cleaned. But then my son suggested we go fly kites, so I dropped the sponge and headed outside. The wind was blowing from the southeast and it was strong. We got a couple of kites in the air for a little while, but the wind was fickle. We had a few nosedives. Plus, it started to rain. As the rain fell harder and harder, the wind petered out more and more. I brought the kites inside to dry and we called it good. I hung them in the mudroom. One of them has a long tail, maybe fifteen feet, so I had to drape it over multiple hooks. Now, after dark, the children tucked into bed, the rain falls hard. They fear the power failing. Before bed they asked if it would go out. What could I say but what I always say? “I don’t know,” I told them. They fell asleep anyway. They sleep to the sound of rain and wind. And I think about having another piece of pie. We are having a bunch of friends over tomorrow and i was planning to make them some soup. I baked up a bunch of butternut squash, an hour and a quarter at 350 degrees, and let it sit for a while. I thought it had cooled enough, but 350 degrees is pretty hot. I toasted my fingertips. I have done plenty of cooking. I do most of the cooking in our house. i try hard to come up with something wholesome and fresh and tasty, so we don’t end up eating reheated pasta with tater tots. I have made soup a number of times this fall. I have to use the pumpkins we grew. This time I used something different. I look forward to making soup tomorrow, but my fingertips are really sore. In fact, typing this right now is uncomfortable. What was I thinking? Whatever. Tomorrow I will whip up the soup. And a couple of pies. Crap, the oven is going to be busy all day. So much for reducing our greenhouse gas emissions. Maybe it will balance out. Local squash and apples instead of California squash and Washington apples. A day of baking can’t pump out too much carbon compared to shipping food thousands of miles can it? After a day of baking I am hoping my fingers will have cooled a bit. I suppose even if they haven’t, some apple pie will distract me long enough to forget about it.